The number five holds a deep significance. We have five senses. Five points adorn a star. Five represents man in theology. For the five members of Hollywood Undead—Johnny 3 Tears, J-Dog, Charlie Scene, Funny Man, and Danny—the digit perfectly encapsulates their fifth full-length offering—FIVE [Dove & Grenade Media/BMG]. Fans can pre-order the new album from here: http://smarturl.it/HUFive. 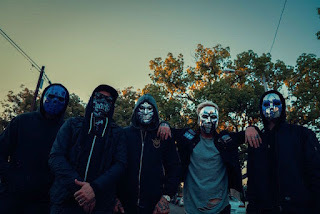 The band have just released the first single/video from their forthcoming album called “California Dreaming.” You can check out the world premiere of the video on Vevo here: http://smarturl.it/CaliforniaDreamingV. The band is pleased to announce a new set of dates in support of V which will begin on September 30th at the Louder Than Life festival. For all U.S. headline shows, Butcher Babies will serve as direct support. Check out the dates below.